What Topics Would You Like to See at Upcoming Meetings? May require proof of membership. Relax and unwind at this special event we have planned for YOU our valued members and guests! Join us for an enjoyable evening of learning, exploration and awards. Bring your colleagues, friends and spouses to experience this energetic and upbeat event sure to lift your holiday spirits! This interactive and entertaining program will provide many opportunities for great insight and discovery along with a lot of fun. We will also recognize and celebrate the value our volunteers have provided throughout this past year and share in our enthusiasm of welcoming our incoming president and recognizing our outgoing president by passing the gavel. 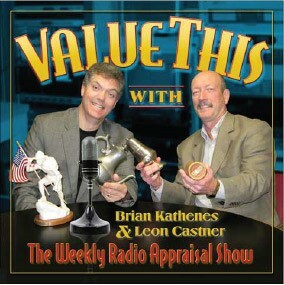 Brian Kathenes, is a nationally known appraiser and founder of the "Value This" syndicated radio show. He is also Principal and President of Progressive Business Concepts, a full-service, training and consulting firm, specializing in organizational performance. Brian will blow your mind with his thorough knowledge of everything that you can put a price tag on. The author of Betcha Didn’t Know That!-101 Antiques and Collectibles Trivia Tips That Can Make You Rich, Famous and the Hit of the Party, Brian will engage the audience from the start of the evening onward. Each person attending may bring one heirloom item for appraisal and review by Brian. The history, construction methods, and value of each item will be discussed along with stories associated with each item. Any vintage item is welcome from old games, dolls, dishes or other oddball items you may dig up. Participants will hear about many rare artifacts and some common antiques, collectibles and memorabilia. There will be time at the end of the session for additional questions and answers. At the event we will provide a buffet meal, soft drinks and dessert, feel free to bring your favorite adult beverage. *Each attendee is welcome to bring one personal item for the appraisal table. Brian is also the Managing Partner of National Appraisal Consultants, the nation’s largest personal property appraisal firm providing integrated publishing, practice building training, and seminars exclusively to personal property appraisers in the United States and Canada. Brian is a consultant, writer, speaker, and published author who specializes in management development and organizational performance. He is President and CEO of Progressive Business Concepts, Inc., a firm founded in 1986. Brian has designed and delivered numerous supervisory and advanced management development training programs for U.S. and global client and has appeared on more than 1000 television and radio programs and has been quoted in over forty business magazines and newspapers including the New York Times, Successful Meetings, Business Philadelphia, and USA Today. He is also the author of the team development news column; How To Build Teams That Will Still Respect You In The Morning, and offers free team development tips at: www.BestTeamTips.com. Brian holds the title: Teambuilding Guru, which was bestowed upon him by Successful Meetings Magazine and Meetings International Magazine Megasite. If you are intersted in sponsoring this event, contact Marian Janes at mj@jancomassociates.com for more information. Updates have been made to the Terms and Privacy section of this site. Click here.